Organ enthusiasts can sometimes be a wee bit snobbish. Sometimes they sniff at certain types and genres of music when played. I do not warm to transcriptions of orchestral and choral works. Others will insist on hearing only high-brow pieces and wonder why there are people who do not like (appreciate, understand or enjoy) Messiaen. Or maybe it is “Back to Bach” where nothing else has any value. But then some folk have a sneaking admiration when the concert organist makes the cathedral “pipe rack” sound like a cinema organ. Certain novelties succeed in bringing the house down, even at a serious concert. The present CD represents 15 composers with various backgrounds and musical aesthetic. It runs a gamut from “In Memoriam of Messiaen” to “I've got a lovely bunch of coconuts”. There is humour, depth, fun and profundity. And this is as it should be: it is a potpourri with something for everybody. The opening number, unsurprisingly, is a call to attention - a Fanfare. Written by American composer Ronald Arnatt, it is a splendid opener that displays the Glasgow University, Memorial Chapel organ’s Tuba stops to dramatic effect. I must confess to disliking the melody Amazing Grace: do not ask why, I just do. However, I got into the groove with Mons Takle’s swinging set of variations on this tune. Kevin Bowyer points out that it is not what one would expect. It fair dances along. Not a Royal Scots Dragon Guard and their bagpipes in sight. Stunning. Equally fun is Ernest Bucalossi’s The Grasshopper’s Dance. It has been arranged for countless instruments and ensembles. I know it in its piano incarnation. The present arrangement for organ makes use of reed stops and mixtures: this effectively catches the insect’s buzzing—if that is what grasshoppers do. A fun piece, written in 1905. The Flourish and Reflection for a Wedding was written for composer Henry Campbell’s daughter’s wedding. The opening flourish has memories of Whitlock’s Plymouth Suite. The reflective middle section exploits two traditional melodies: The Londonderry Air and The Bonnie Lass o’ Ballochmyle. These represent the bridegroom and the bride. The work regains momentum with a reprise of the toccata. It is an effective piece that could be used at any festival or event. Marco Lo Muscio is an Italian composer and organist. His homage to the French master is striking. It is written as a diptych: a Messiaenic slow movement evokes mystical matters, and is followed by a paean of praise. If one did not know, the listener may imagine that Kevin Bowyer had found a lost work by Messiaen. Pastiche and parody all rolled into one, and none the worse for that. Not sure about The Naughty Boy by Paul Fisher. Speech and music mixed up in this Monty-Pythonesque burlesque exploring the theme “He’s not the Messiah, he’s just a naughty boy”. Lots of allusions to other music, including Richard Strauss’s Till Eulenspiegel, Christmas carols, ragtime and blues. Just did not work for me. I enjoyed the Handel-inspired Little Stanmore Suite. Most people will think of Stanmore as being at the end of the Jubilee Line. However, near Canon’s Park, the first station heading back to The Smoke, there is the church of St Lawrence Whitchurch, where Handel once played. Bowyer assures us that only one rank of open diapasons from Handel’s day survives. The Little Stanmore Suite is quite short; each movement lasts around a minute. It is a well-contrived work that owes nothing to Handel’s music but a lot to his life and times. Movements have amusing titles such as James Bridges’ Knees Up, referring to the Duke of Chandos, Handel’s employer, Ach, mein wig hast blown off, and The Blacksmith’s Donkey: with tail between legs. This latter refers to the well-known Harmonious Blacksmith. And then comes I've got a lovely bunch of coconuts. It was originally composed by a committee of composers, given the pseudonym Fred Hetherington. Kevin Bowyer takes this reasonably seriously. He swings it a bit, yes, but also turns it into a regular tuba tune. Great fun. Not sure how this would go down as a recessional voluntary after the Kirk’s morning service, though. Peter Warlock’s witty, satirical take on music issued in his Four Cod Pieces are not as well-known as they should be. The third, Beethoven’s Binge, and the fourth number, The Old Codger, poke fun at Beethoven’s 5th Symphony and Cesar Franck’s Symphony in D minor respectively. They are “music hall ballet” and as such must be taken with a pinch of salt. Jazz and ragtime feature in these pages. It is surprising how little- known these satires are. Festive Flutes by American composer Everett Titcomb is a lovely little number. Written as a diminutive scherzo, emphasising the flute register, this work weaves it subtle magic quietly in the form of a toccata. It is my favourite piece on this disc. The 1986 Prelude and Fugue by Fredrik Sixten was composed as a homage to the great French organist and composer, Maurice Duruflé. After a slow introduction, the Prelude develops as a quiet scherzo, with echoes of the dedicatee. This is haunting music. The [double] Fugue is impressive, and after some effective working out brings the piece to a triumphant conclusion. Ernest Tomlinson was one of the best-known composers of light music. His Little Serenade has been dished up in a variety of arrangements. The piece began life as a part of the score of a radio musical play, The Story of Cinderella. Interestingly, the book for this musical was written by Roy Plomley of Desert Island Disc fame. It was first performed in 1955. The Serenade is featured early in the tale, when Prince Charming first sets eyes on Cinderella. It is at the moment when she is unaware of his princely rank. The song develops into a love duet. This is a “delicately winning” little number (The Gramophone, March 2000) that bears many hearings. This organ arrangement by Tomlinson is delightful. Charles Procter is a name that seems to sit at the back of the mind. Try and name a piece of music by him and I guess most of us will get stuck. I only recall his name as a contributor to the series of graded piano pieces, Five by Ten. These were published by Lengnick in 1952 and are, I believe, still in print. The five volumes were edited by Alec Rowley and had works specifically commissioned from composers as diverse as Edmund Rubbra, Madeleine Dring, Bernard Stevens Malcolm Arnold, Julius Harrison, Elizabeth Maconchy, William Wordsworth, William Alwyn, Franz Reizenstein and Charles Proctor. Many are little masterpieces. The Lord Warden’s Rondo alludes to the Warden of the Cinque Ports. This office has been held by many famous people, including Winston Churchill (1941-1965) and Queen Elizabeth, the Queen Mother (1978-2002). The present warden is Admiral of the Fleet, Lord Boyce KG GCB OBE DL who was appointed in 2004. His official residence is Walmer Castle, near Deal. The five Cinque Ports are Hastings, New Romney, Hythe, Dover and Sandwich. Proctor’s take on the situation is to provide a quiet, restrained little meditation rather than a flamboyant processional or march. String stops are to the fore, with the general dynamics of pianissimo. There are some effective key changes. This would be an ideal piece to play before Evensong. Rona’s Day, by Patricia Cornish, is another little number composed for a wedding at Glasgow University Memorial Chapel. It is a gentle, piece that builds to a restrained climax. An Oxford Elegy will remind many listeners of RVW’s beautiful setting of Matthew Arnold’s poetry for speaker (John Westbrook, preferably) and cathedral choir. Frikki Walker (organist of St Mary’s Cathedral Glasgow) wrote an eponymous piece which has nothing to do with Scholar Gypsy’s or Thyrsis. It began life as an advertising jingle, and was latterly used at a choral seminar at Chichester, when Walker needed to fill in a few awkward moments of silence at Matins. The resulting improvisation was recorded and subsequently noted down, and the score published. It is a lovely meditative little piece that is much more valuable than a gap-filler. Kevin Bowyer’s pithy programme note for the final number, Swing Low, says it all: “Another Tikle piece, currently my favourite for encores. It roars and brings the house down.” I could not have said it better myself—a fitting conclusion to a remarkably enjoyable CD. 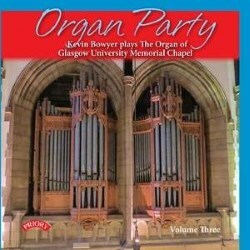 Like all good organ CDs, Organ Party III gives a brief history of this splendid organ. It was originally commissioned in 1927 by Henry Willis and Sons, and restored by Harrison and Harrison in 2005. It was a gift to Glasgow University form Joseph Paton Maclay, Lord Maclay, in memory of his two sons who were killed during the Great War. A full specification of this 3-manual instrument is given. There are biographical notes on the present soloist, who is the current incumbent at the Memorial Chapel. The liner notes are succinct, giving sufficient information to gain an understanding of these eclectic pieces. For enjoyment, no information is needed: just ears that are open to a wide variety of musical styles. The advertising blurb on the Priory Record website states that this “third outing in this outrageous series features the organ that Kevin Bowyer knows best as its organist”. I have not heard the first and second volumes. Bowyer explains that the university hosts many kinds of events from weddings to festivals and that he is asked to play music drawn from right across the board: “I am proud to have no scruples…some would say no taste!” This is disingenuous: all the pieces on this CD are of interest, some are deeper in intent than the word “party” implies. All are done in the best possible taste. It is good to come across a musician who, as they say in parts of the North Country, has no “side” on him. As stated above, playing music ranging from “In Memoriam of Messiaen” to “I've got a lovely bunch of coconuts” shows imagination and fun. Which is a large part of what musical performance should be about, and is often forgotten by some po-faced concertgoers.